Fax to email and the reverse operation are now available anywhere and everywhere in the world. Soon you’ll be able to send and receive from Elysium, too. Today state of the art technology allows such freedom and innovation that it seems futuristic. Save lots and lots of money by not having dedicated fax lines, not using any expensive high grade printing paper and, even more important, don’t ever again buy another expensive colour cartridge for you printer. Yay! You will also save electricity by not printing so much drivel. Your internet connection is now your fax line too. This keeps everything tight and controllable as well. All these seemingly minor savings will all add up and will really be worthwhile. Rather give your staff a bonus. Just saying! Go green as well as save money by choosing this internet option. Corporate consciousness towards the environment has increased enormously in recent years because of social conscience and also because of legislation. Many companies are going green to comply with international regulations and to appease their need to improve life on our planet. No company can disregard the drive to reduce damage to our world any longer. 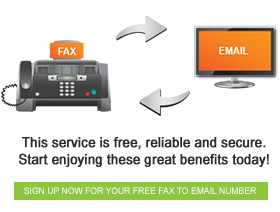 Fax to email has really revolutionised how communication can be run between companies and within companies. Receiving a fax is completely and absolutely free. There are no maintenance costs and to sign up is free too. Sending a fax, however, costs a minimal fee which is entirely controllable by you because you buy prepaid credits and you have control over the purchase. Never mind, it’s still much cheaper than faxing and printing. Give it a try.